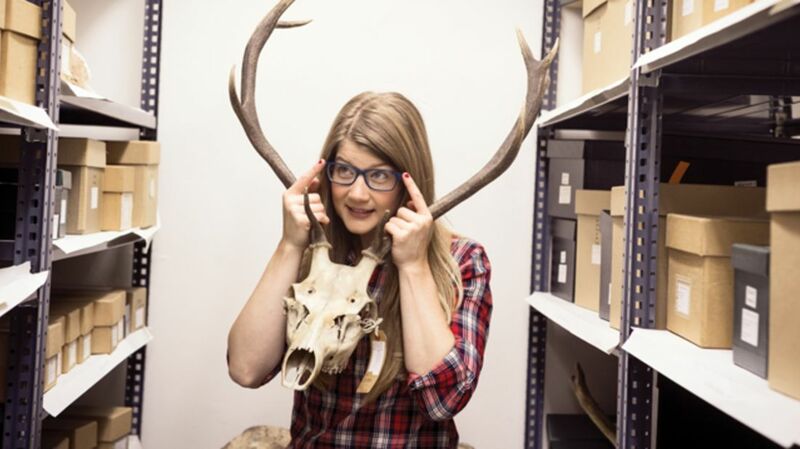 When Emily Graslie, 26, started The Brain Scoop, she was just hoping to find a few like-minded Tumblr readers to share her love of taxidermy. Five years later, she has 300,000 rabid fans tuning in to YouTube to watch her explain everything from millipede reproduction to specimen dissection. Here, Graslie tells us how she became the first-ever chief curiosity correspondent for Chicago’s Field Museum, where she’s tasked with introducing natural history to a new generation. I was always an “outside” kid. I wanted to make epic paintings about the natural world, so I declared my art major my first day at the University of Montana. I was surrounded by natural beauty, and knew it was a resource we were losing. She said, “If you can sew a stuffed animal like in home ec, you can skin a mouse.” It was true! I got to sign my name on the label, the same way you might sign a piece of artwork. I started volunteering at the museum and painting portraits of specimens. But oil paint takes so long to dry, so I started doing photography, posting photos on Tumblr and hoping I’d find others like me. And I did! I met Hank Green of Vlogbrothers, which is huge on YouTube, and he asked if I’d be interested in having my own show. That show, The Brain Scoop, has just passed 300,000 subscribers. In April 2013, we had a meet-up at Chicago’s Field Museum, and 100 fans came. The museum’s president told the head of collections they needed to hire me. Now our videos are produced there. I could keep making videos where we open a specimen drawer and go, “How cool!”—or we can work to secure funding for scientists. A curator at the Field Museum needed evidence that his research would reach the public to win a National Science Foundation grant, so he asked if we could do a series. We got the grant! I’ve also become an activist, opening up the conversation about how to keep women and minorities in the sciences. I want to tell more cool stories—I just don’t know what form they’ll take next.